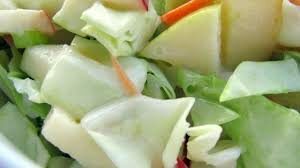 Combine the coleslaw mix and apple in a large bowl and set aside, In another bowl, combine the rest of the ingredients to make the dressing. Whisk until it is all incorporated and has a creamy consistency. Pour over the coleslaw/apple mixture and toss until coleslaw is coated. Enjoy right away or store in your refrigerator until ready to eat.